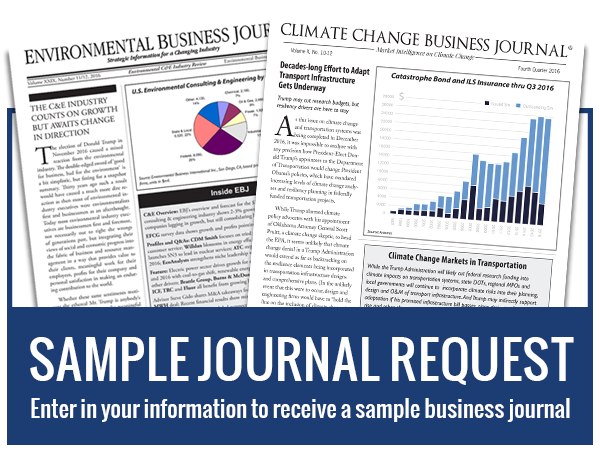 Climate Change Business Journal ®, launched in 2007 as a subscription based business research publication, serves as the centerpiece of business intelligence providing detailed market research on nine segments of the Climate Change Industry. In each edition, subscribers receive a strategic overview of a specific industry segment, plus company profiles, survey results, and a proprietary data package with market size, growth and company rankings. Through editorial research, proprietary industry surveys and data analysis, CCBJ identifies companies participating in these evolving business segments, tracks metrics including market size and revenue growth, and follows business and regulatory trends affecting the Climate Change Industry. CCBJ also highlights segment leaders and new entrants, climate change investment opportunities, the performance of publicly traded and private companies, and the Climate Change Industry’s contribution to the economy. Economic and political analysis places each segment in the context of the larger Climate Change Industry and of the conventional industries it impacts. By tracking the size and growth of the Climate Change Industry, CCBJ newsletter provides companies and investors with an independent source of financial data for business planning, benchmarking and financing documents. In addition, policymakers and NGOs benefit from our framework for measuring the economic contributions generated by this newly defined industry, independent of its social and environmental benefits. Each CCBJ issue is dedicated to a single Climate Change Industry segment. Editors interview 30-40 climate change executives and thought leaders for each edition, providing subscribers with perspective from nearly 500 companies in the course of a year’s subscription. We also conduct regular Climate Change Industry surveys to gather primary data. Our encyclopedic approach ensures you don’t miss out on major strategic trends or unseen competitive factors. Which sample journal would you like to be sent to you? 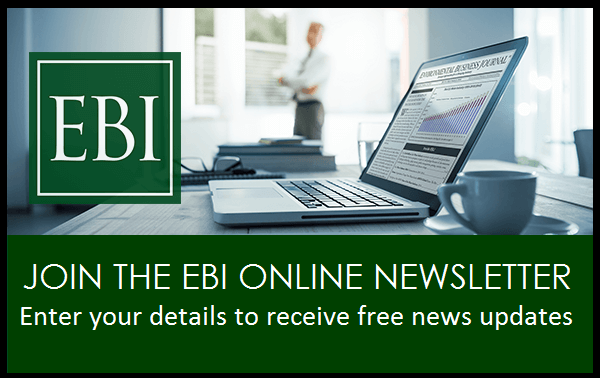 Yes, add me to the EBI newsletter so I can receive up to date information on environmental issues and upcoming summits.